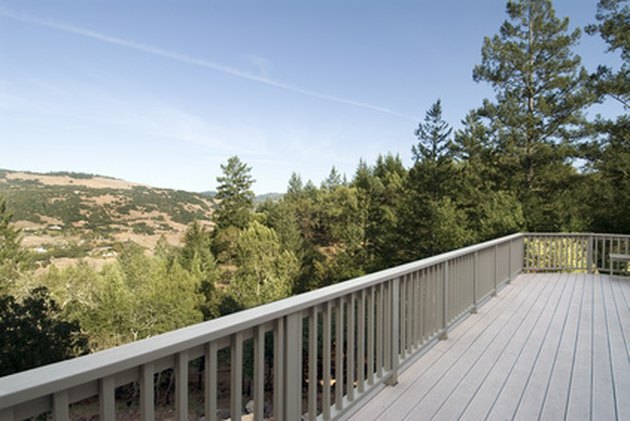 The railing on a deck helps prevent falls. Injuries from falling off decks can be devastating, which is why the North American Deck and Railing Association worked with the International Code Council to tighten deck railing regulations, as specified by the International Residential Code. Washington state strictly enforces the deck railing codes to keep homeowners safe and prevent unnecessary injuries. Deck railings keep people and pets safe. If a deck is elevated over 30 inches from the ground, guardrails must be installed. Studies by the North American Deck and Railing Association have shown that even short falls can lead to serious injuries. The International Code Council developed this rule to prevent injuries and improve safety for deck users. Railings are required to support 200 pounds of lateral pressure. This means that a force of 200 pounds can be applied directly to the guardrails and they will withstand the pressure. If the guardrails are secured correctly, this is an easy code to meet. Guardrail supports must be secured with galvanized bolts through the deck framing. This provides the foundation for the guardrails and will be very strong when the supports are tied together. The rails and spindles must be attached with galvanized screws or nails. Galvanized fasteners are weather-resistant and will not rust or decay. The height of the guardrail must be a minimum of 36 inches for residential applications and 42 inches for commercial properties. Commercial properties do not include rental homes, duplexes or any other property that is zoned R-1-4.